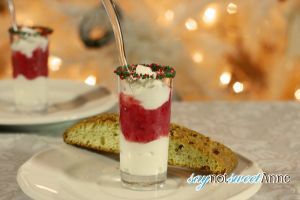 The holiday season is full of overly sweet, overly fattening and generally good for nothing desserts. I say good for nothing, but really, they are good for being DELICIOUS. So, I thought I’d try my hand at something a little less heavy. My mother in law makes a no-bake cheesecake that my husband adores. Its mostly cream cheese, vanilla and powdered sugar topped with syrupy fruit. Its not precisely good for you – but it is SOOO good. So, I started there for my healthy Christmas Treat inspiration. These desserts are perfect for parties because they can be made a couple days ahead of time! 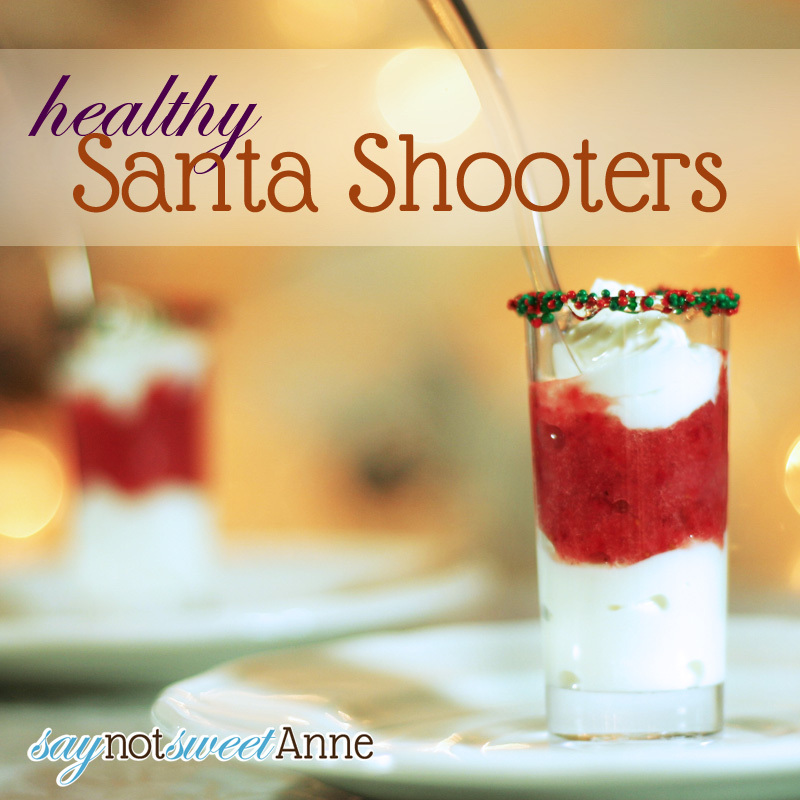 I call it Santa Shooters. Its basically a strawberry cheesecake/yogurt shooter, but it looks so festive it needed a festive name! Now, this is not exactly a recipe. I say that because I’m going to use the words “to taste” an awful lot. Everyone wants different things in the way of sweetness. So- forgive me. You’re just going to have to taste it! Shot glasses. I used these tall skinny plastic ones. No cleanup and they are cheap in bulk for Christmas parties. 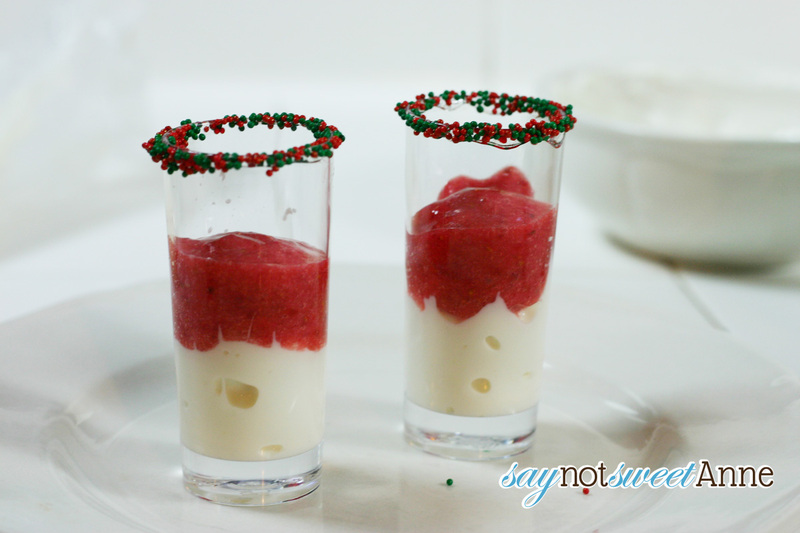 Festive Sprinkles and Corn Syrup (optional). 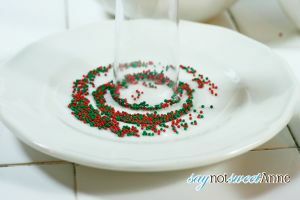 If you’re going for the festive look, pour a little bit of the syrup on a plate, and some of the sprinkles on another. 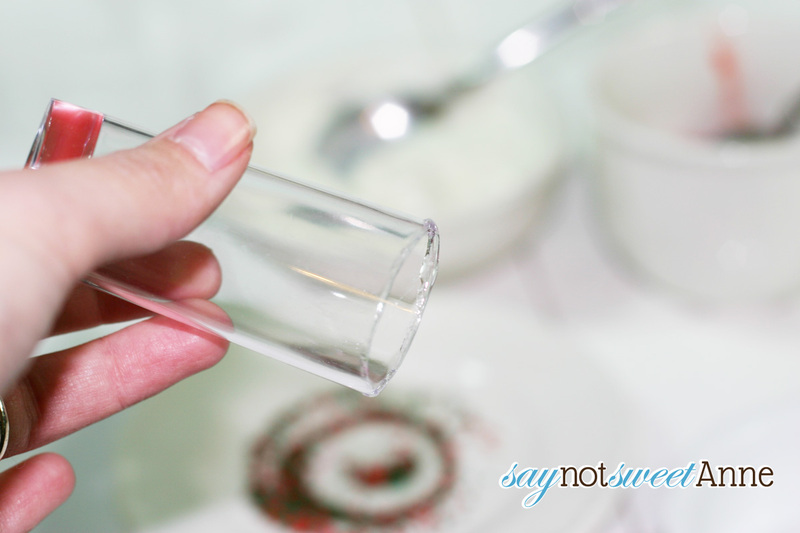 Dip the rim of your glasses in the syrup and then into the sprinkles. Set those aside. Depending on how many you want to make, this recipe scales. 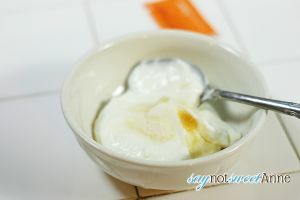 For the two pictured, I used about 1/4 cup yogurt. It’ll really depend on the size of your glasses and the amount you’re making. Anyway, scoop your yogurt into a bowl, and add your chosen sweetener and vanilla to taste. Next, pulse your strawberries in a food processor or mash them with a fork. I like mine to be very smooth- so I pulse it all to smithereens. Add your sweetener of choice…to taste. Well, that’s it! You’re ready to assemble. 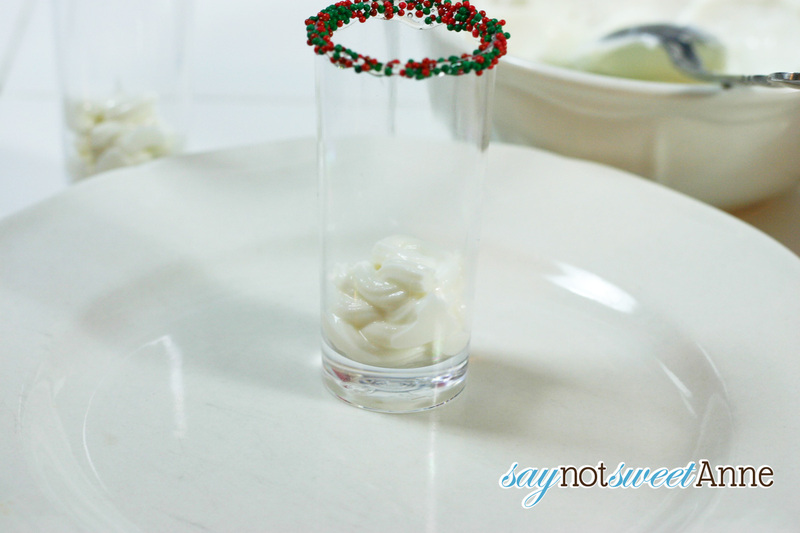 I used a piping back with a star tip to get the yogurt layers in without messing up the glasses. Just tap the glass on the table gently (so not to dislodge all the sprinkles) so the yogurt settles. Then add the strawberry mixture and the second yogurt layer. Finish with a little spoon! Alicia Denman recently posted..Winter Wonderland Wednesday! These are great! Thanks so much for sharing at Marvelous Mondays! I will be featuring these at tonight’s party! Hope to see you there. Merry Christmas. This is so cute & yummy! Looks great. Will definintely have to try these!! Visiting from Made by you Monday.